With the exception of a few locations, tourist destinations during Costa Rica Spring Break are crowded with groups of students learning first-hand about nature, sustainability, and adventure during the day. At night, that’s another story. The months of March and April, within the North American academic school year hiatus, are regarded as Spring Break season. During these months most of Costa Rica has pleasant sunny days and maybe some scattered showers every other afternoon. Although Spring Break trips to Costa Rica are not the norm from the US and Canada, there are certain spots that turn the volume up and like to party during this time of year. Places with club and bar aligned streets shooting bright lights and beats into the night. And most of the time, into the early morning. Soon the cycle begins again. Favorite tourist destinations can get a little hectic during Easter Weekend. This is when the locals team up with foreigners in a festive celebration of freedom from work and school throughout Costa Rica’s most popular places. The dry forest beauty of Tamarindo Beach is a prime destination for Costa Rica Spring Breakers looking for an energized beach town and the highest probability of sunshine. The beaches at Playa Tamarindo are ideal for sunbathing and learning to surf. Expert surfing beaches are nearby. 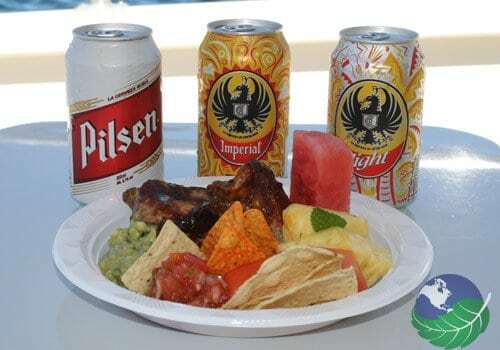 An open bar catamaran cruise can take the festivities into the horizon. Come witness the coast from the perspective of the blue Pacific Ocean. Take some nature trips to places like Rincon de la Vieja or Arenal for a hike or a great relaxation and outdoor adventures or Monteverde Cloud Forest for a stunning forest canopy. When visiting the cloud forest like Monteverde, make sure to pack a light jacket since they can get pretty cold and even rainy. Playa Grande, a quiet beach bordering Tamarindo Costa Rica sometimes hosts leatherback turtles in Las Baulas National Park. Why not try and spot them? Or if you are up for something different entirely, why not take a scuba diving trip to discover the beauty under water? Jaco Beach is on the Central Pacific coast and one of the closest surfing beaches to San Jose and the populated Central Valley of Costa Rica. Tall skyscrapers stand over the beach tree line giving Jaco the status of the city. The days of the quaint beach town are long gone. Jaco is a busy tourist center for surfers and visitors looking for entertainment and nightlife; because of this, it’s not ideal for a family vacation package to Costa Rica. The port town of Quepos, near Manuel Antonio National Park, has always been a fun place to go bar hopping. The city center of Quepos has lively clubs and bars with plenty of pretty people moving to those Latin beats. If you enter Manuel Antonio Park during Easter weekend, prepare yourself to see large groups of teachers and students learning from the parks licensed tour guides that can be found at the entrance. To avoid large crowds, at least for a couple of hours, go early at 06:30 am before the gates open. Manuel Antonio also has a stunning beach line. Why not take the opportunity to go for a horseback riding tour? Costa Rica’s capital city, San Jose, is in contrast, the most desolate place in Costa Rica during Easter weekend, starting on Monday-Thursday. Visitors might find walking the abandoned city streets during these days a surreal experience, ideal for contemplating metropolitan history through its architecture and parks. By the time the locals come back to the city from their break, most of them go to work then sit quietly at home waiting for the next paycheck. Travel to the Caribbean Coast for a whole different kind of spring break experience! The community of Puerto Viejo is very different from those at the Pacific Coast. The Afro-Caribbean culture that defines the area of Limon, is even more laid back than the typical Pura Vida Ticos. Keep in mind that in April, this side of the country will be more rainy than places like the province of Guanacaste of even the Central Pacific. The legal drinking age in Costa Rica is 18, which may lure young tourists into the country with the idea of quenching their thirst with a cold one after a day of activities. Beware of the Holy Thursday and Friday dry law when you cannot purchase a beer nearly anywhere in the country. The purpose of such endurance is to try to get the local population to reflect on the Christian holiday, after all, the official religion of Costa Rica according to its Constitution is the Roman Catholic Church. Yet the outcome of locked liquor shelves is doubtful since this prohibition has always lead to more consumption; that’s why Costa Rica is in full celebration mode during those special Easter weekdays.